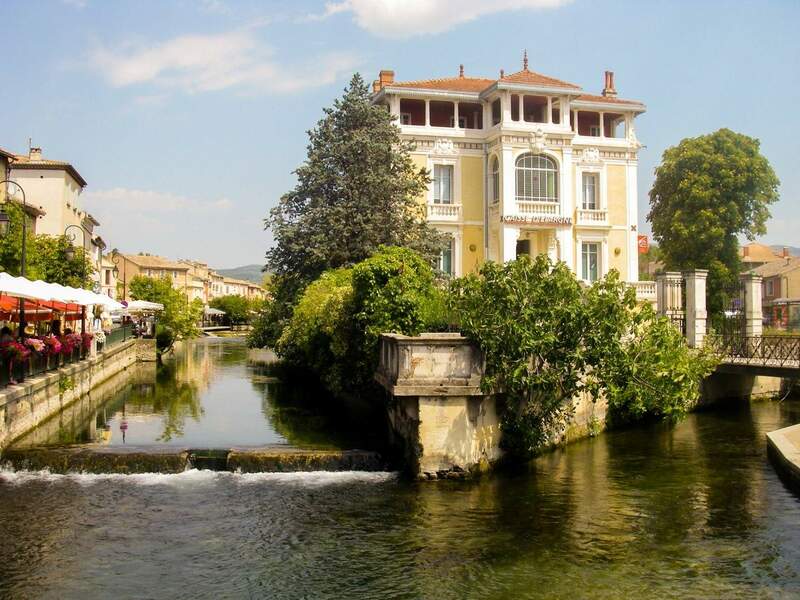 L’Isle-sur-la-Sorgue, also known as the Venice of Provence, is an iconic little Provence town with much to commend itself, whether you come for the antiques, the markets or the old town itself. L’Isle-sur-la-Sorgue means the island on the river Sorgue. It is the crystal-clear Sorgue which gave birth to the town, the water wheels scattered about provide the clue. The wheels drove textile mills, and the textile business is the source of the wealth still evident in the architecture of l’Isle-sur-la-Sorgue, with its grand houses and surprising church. The Sorgue river, omnipresent, clear and cool, comes out of the ground ready-formed at Fontaine de Vaucluse a few kilometres away. In summer the river is the scene for various colourful activities, like water jousting and the floating carnival called the Corso Nautique. If you fancy a dip, head for the Partage des Eaux (the Parting of the Waters) a short walk out of town. This is where the river cuts in two and effectively makes an island of L’Isle-sur-la-Sorgue. It’s an idyllic spot, the river green and clear, big trees overhanging on the banks, even a couple of simple restaurants. You’ll want to jump in, but a word of warning – the river is so clean because it has just come from deep underground at Fontaine de Vaucluse, but this also means that the year-round water temperature is 13°C/55°F. It’s wonderful once you get used to it! The economy of L’Isle-sur-la-Sorgue is no longer driven by the river, but by antiques.This is the biggest antiques centre in France outside of Paris. Aside from markets there are permanent antique shops and antiques ‘villages’ – these are collections of dealers in disused warehouses, mansions and courtyards, about 300 of them, open from Friday to Monday all year. Even if you are not buying, it is fun to browse because everything is here. The Campredon Centre d’Art puts on 3 modern art exhibitions a year in a gorgeous 18th century mansion which is partially classified as a Historical Monument – worth visiting just for the building. Housed in a beautiful villa by the river, Villa Datris is dedicated to contemporary sculpture, both inside and in the garden. It is open from May to October and entrance is free. The Antique Toy and Doll Museum (Musee du Jouet et de la Poupee Ancienne) is the result of one local’s obsession – Huguette Jeanselme – who collected all the exhibits, ranging from the 18th century to the modern day. If you like antique dolls, you will like it, and if you find dolls a bit creepy you should avoid. Parc Gautier is a lawned park in the centre wih playgound for smaller children and skatepark for older ones (and the bonus of one of the old grand houses of Isle-sur-la-Sorgue to look at from the outside, Chateau Gautier). Have lunch at La Villa restaurant, the children can swim in the pool, and after eating you can keep an eye on them from the sunloungers. And it’s a good restaurant. Kayaking down the Sorgue, from Fontaine de Vaucluse down to L’Isle-sur-la-Sorgue, with either Canoe Evasion or Kayak Vert. Younger children will enjoy spotting fish from a bridge or feeding the ducks, and then find the giant ear in the water. Villa Datris, with its contemporary sculpture inside and out, is intriguing and accessible for children. Highly rated chef Daniel Hebet presides over a classy dining experience in a delightful walled garden, loved by locals and visitors alike. There is a set menu with no choice, it depends what the chef found that day. This will not suit everyone, especially fussy eaters. The setting is an old town house and being in Isle sur la Sorgue means antiques and collectables make up the elegant decor. 3-course menus are 37 euros at lunch and 45 euros for dinner. L’Aparte is a simple place offering good value for money, and a perfect spot for people watching on market days. Food is Provencal, and it quickly fills up with locals who appreciate the unpretentious, friendly service. As the owners say, what they do is simple, but not simplistic. Set menus from 14 to 28 euros. Tucked away in the centre of the old town, La Prevote is a foodie’s delight. There are some unexpected dishes that are nevertheless balanced and palate-pleasing: scallops grilled with yuzu; fricassee of sweetbreads and white pudding; guinea fowl stuffed with crab. A 2-course lunch menu is 23 euros, for dinner there are 3 courses at 46 euros and 5 courses for the real foodie at 60 euros. If 5 courses are not enough, go for the 6-course winter truffle menu at 90 euros. There is a courtyard garden but even if you eat inside you will find a river runs through the restaurant. The cool place in l’Isle-sur-la-Sorgue, decor and music are spot-on, it’s friendly, loved by locals, impossible to find without GPS! In winter there is the very cosy interior and in summer tables are round the pool. You can choose from a tapas menu or a regular menu. Tapas is about 6 euros per dish and main courses are around 18 euros. Budget: Mid | Opening Hours: Open Sunday lunch, and Wednesday to Sunday for dinner. A bar with restaurant in the brasserie style where locals go, a long way from fine dining but good honest food – great burgers and fries, steak and also oysters. You can have a set lunch here of 2 courses for 12 euros. Creative cooking on the river, and a Michelin star with prices to match. But you can still get good value with the market menu, which is 2 courses for 26 euros and 3 courses for 32 euros, available during the week. There are fancier menus at 53 and 75 euros, and then a la carte it is considerably more. The focus here is on seafood (freshwater too), the aesthetic is modern, the food intricately prepared and presented. The wine list is excellent, if expensive (especially by the glass). Husband and wife team do everything here, he is in the kitchen and she (Canadian) runs front of house.Mistral is small, only about 30 covers, with clean lines and no hint that you are in the bric-a-brac/antiques centre of Provence. The name says is well – modern bistro. The menu is not long and it is all fresh produce from the markets, even the ice cream is made in-house. Even with only two people, the service is great, the food impeccable. 3-course dinner menu at 28 euros. Budget: Mid | Opening Hours: Summer opening: Wednesday to Sunday for dinner, Thursday and Sunday for lunch. Closed Monday and Tuesday. L’Isle-sur-la-Sorgue is where we come for a little bit of refinement – whether that is in the food or the shopping, L’Isle-sur-la-Sorgue is a step up from the villages. Water everywhere! Provence can be a parched land, L’Isle-sur-la-Sorgue is a counterpoint to that, with running water never far away. Of course the markets – Sunday is a perfect storm of antiques, bric-a-brac and food, and there’s a great choice of lunch venues too. The prices at an antique or bric-a-brac stall are just starting points for negotiation. You should never pay the asking price!